So, you’ve landed a coveted job somewhere overseas and gorgeous, bucket list worthy adventures are a mere heartbeat away. Sure, you’re over there to work, but you’ll need to pack more than button-ups and and work-appropriate heels to take advantage of every moment of your weekend and downtime. Since you’ve already quit your job or negotiated a work transfer, you clearly understand value of balancing life, work, and play—which in this case means travel! Working abroad is an unforgettable experience, not only because you’re paid to eat and breathe a new culture every single day, but oh, those glorious weekends—they’re so close you can almost smell the travel adventures. For some travelers, you won’t start your job hunt until you get there—which means you’ll have to pack for interviews, as well as daily work and your epic travel plans. Basically, you need to pack exactly the right gear for all your possible plans. Chances are, your work and interview attire will vary greatly from the more casual clothing you’ll wear to travel. And depending on the type of job you’re seeking (or the one you’re already contracted for), you’ll need to bring specific tools and any prior certifications. All in all, packing for the experience of working overseas can certainly be overwhelming not matter the type of work you have planned—maybe you’re on a long-term business trip, or working an overseas job (perhaps as an au pair , via a working holiday visa, or by teaching English). For each one, you have to plan for both work and play. 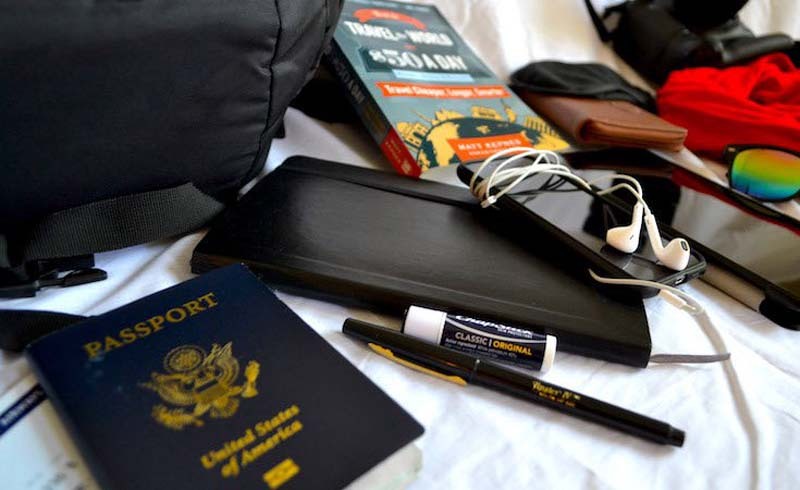 Here’s the download on packing essentials you should always have in tucked into your duffel when working overseas to stay organized and stress less. Include both professional and casual clothing. Odds are, much of your time will be spent outside work, traveling, or hanging out, so the majority of the pieces you pack should suit those needs. As for professional clothing, include a few outfits that will work for job interviews in your chosen field, and keep it simple. Think: solid colors and layers that you can mix and match into different looks. Women should also bring jewelry, scarves, and other accessories that can dress up a casual look (but remember to leave the priceless jewelry at home and pack items that won’t take up tons of space in your wheeled suitcase). Organize your items into packing cubes to keep your tops, bottoms, and accessories separated and easy to locate. Also consider what type of clothing you’ll actually wear to work once you land the job. Though some jobs, like those at bars and restaurants, will assign you uniforms, you likely won’t know if that’s the case until you get hired. Hospitality jobs typically require employees to wear solid, black, or white collared shirts and black pants, so bring a couple of those from home. Pack the items that you don’t want to get wrinkled in a packing folder for best results. As for shoes, try to bring as few as possible, and make sure that you have at least one comfortable pair (remember, you’re packing for travel adventures, not just work!). For women, one pair of nice, black flats will work, while loafers are best for men. If you’re applying for an office job, you might need more than one pair, but consider shoes you can wear both in and out of the office. And bring something comfortable that you can wear around town, specifically when you’re dropping off resumes, like a pair of casual sneakers. Toss your choices in a shoe sac to ensure the rest of your gear stays clean. When I moved to Australia on a working holiday to find a job at a bar, I didn’t pack a number of things that I wished I had—like my favorite brands of toiletries from home, and makeup, which would have been handy for my initial interviews. I later bought items to put in my toiletry bag, but it’s nice to have a few comforts from home to start, like your beloved perfume or favorite lotion. Just remember to stick to ones that are TSA-approved bottles, or plan to check your bag. 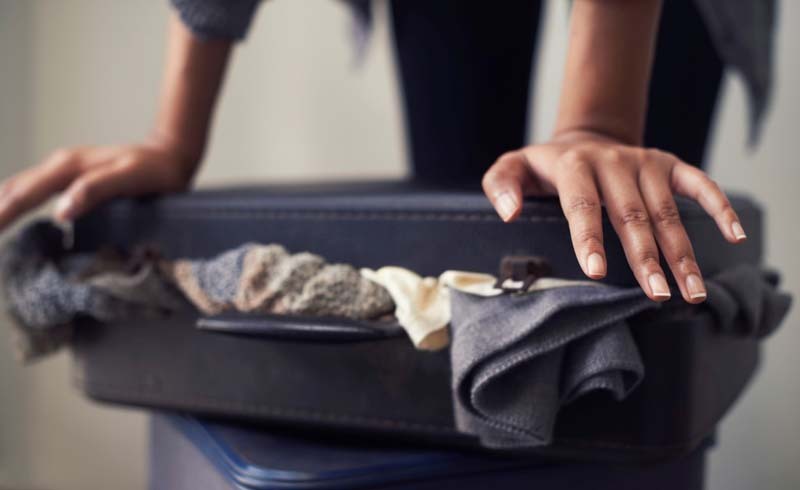 When you’re moving overseas for a long period of time—or indefinitely—it’s easy to fall into the trap of packing too many suitcases filled with too much stuff from home. But the truth is: You don’t need as much as you think you do. Consider bringing whatever you can fit in an international carry-on to start and buying additional items once you better know your needs. If you know you need extra gear from the start, a large wheeled duffel is, by far, the best way to transport your essentials overseas. Rolling bags provide you with more flexibility to get around and won’t hurt your back and shoulders. For getting to and from work, quick weekend trips, and for your personal items on long flights, bring the Convertabrief . The bag has a laptop pocket that opens butterfly-style, separate pockets for your headphones and smaller items, and optional backpack straps. To make your job search easier, bring a few printed copies of your resume or CV, as well as a digital version that's on a USB drive or in cloud storage. If you have specific certifications that will further help you get a job in your chosen field, bring copies of those, too. Most importantly, bring your passport and work visa. Keep them both safe in a money belt while traveling, and using and RFID wallet once you’re on the ground. Your overseas work trip offers an incredible opportunity. Before you step foot on the plane, make a commitment right now to take advantage of every weekend and every second of free time to step out of your comfort zone and find your unknown.